At #CES2018, VR-Connection unveiled HESTIA VR, in association with R-Cade, it’s described as the first VR plug and play terminal fully customisable, incredibly flexible and allowing people to discover virtual reality via a simple and ergonomic terminal. Virtual reality experts VR-Connection are on a mission to democratise access to virtual reality with quality content. With this key objective in mind, VR-Connection has partnered with with R-Cade to develop HESTIA VR, the first VR plug & play terminal. HESTIA VR lets people discover virtual reality through a simple and ergonomic terminal, which can be adapted to fun practices such as training or learning. Following several months of design and collaboration between various EIG companies, this 1980’s style arcade terminal features a contemporary look and cutting edge features. Hestia VR can be deployed and used in playrooms, in-store or retail showrooms, at events or in corporate buildings. 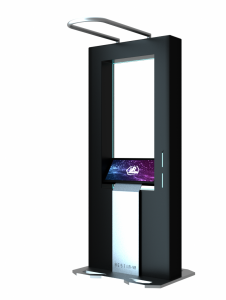 The initial idea was simple; to create a kiosk compatible with most VR accessories (such as VR helmets, controllers or treadmills), and to deliver first class content from EIG companies, according to customer needs. VR-Connection offers a true synergy between video games and gaming room experiences; product presentations for the stores and retail, and training within companies. From the development of user interfaces and new immersive technologies, each of the EIG partners brings its own expertise, providing a result that closely matches the expectations and needs of the market. Hestia VR, whose production is entirely located in France, has been available for pre-order since February 2017. Ian Toullec and Alexandre Ibanez, two French Virtual Reality specialists, launched VR Connection, an Economic Interest Grouping (EIG) bringing together more than 60 companies. Their goal was to create the first collaborative HUB with the best virtual reality experts in Europe. This HUB aims to encourage collaboration between VR content producers and organise an ecosystem able to address all types of markets. By early 2018, VR Connection will bring together an ethics committee (scientists, sociologists, psychologists, etc.) to define good VR practices and eventually create the first European Virtual Reality Charter. This entry was posted on Wednesday, January 10th, 2018 at 21:21 @931 and is filed under Scuttlebut. You can follow any responses to this entry through the RSS 2.0 feed. You can leave a response, or trackback from your own site.